Keeping a green lawn year-round is quite a task, and it can be expensive, too. Here’s a simple solution: a very real looking synthetic lawn form Southwest Greens of San Diego. There’s no better way to have year round green grass with no watering, no fertilizer, no seeding, no mowing or dust. Put an end to back-breaking weekend yard work. Just enjoy lots of fun at your home, office, wherever you want it! Synthetic grass play areas are safe and guaranteed green all year round so your family can play outside in soft green grass all year long. It’s even pet friendly. If golf is your game, you’ll love our love our custom designs that will perfectly fit your area and give you an excellent practice space. Wouldn’t you want your practice area designed by someone who was entrusted by the Pro Golfer’s Association for courses throughout the world? 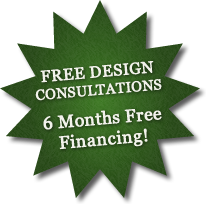 Whether you are looking for a residential or commercial synthetic grass lawn, play area, or golf putting green, we’ll create a custom design that is perfect for you. We’ll look forward to meeting with you soon. Through partnership with your local government, HERO is available to you as an affordable way to make energy efficient, water efficient, and renewable energy upgrades to your home. Use HERO to finance artificial grass installation, which can even increase your property value, lower your monthly utility bills, and contribute to making your community more water and energy independent.